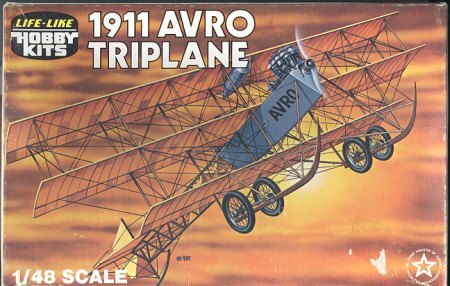 In 1909, Alliott Verdon-Roe (AVRO) succeeded in coaxing his original triplane into the air. This aircraft was driven by a JAP engine producing a whopping 9 hp! The design was modified and the 1911 version was powered by a 35 hp Green engine. As with many early aircraft, lateral control was by wing warping, while the aircraft did have a normal rudder and elevators. As a commercial success, it was a failure, but it did provide the basis for more successful aircraft. Most of us will remember this plane as Terry Thomas' mount in 'Those Magnificent Men and their Flying Machines'. Thanks to the age of the kit, the moldings are still very nice and crisply done. The fabric effect is a bit of the 'hills and valleys' that many mention, but really not that badly done at all. There is no real cockpit as we perceive one today as the pilot sat on the upper fuselage with only his lower legs inside. The Green engine is well detailed as is the prop and pilot. You might expect a mass of struts on this kit and those are provided in large numbers. Since it is a triplane, many of the wing struts go through holes in the center wing, thus affording some rigidity to the structure. The wheels are supposed to be open spoke bicycle types, but the molding of the time doesn't allow for that kind of detail. There are aftermarket bits that can be substituted if so desired. The kit comes complete with a stand. Instructions are well done and typical of the time. 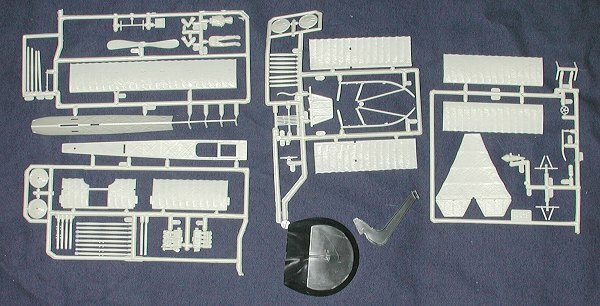 It consists of a large exploded view diagram with all parts numbered. A written construction sequence is provided. Also provided, and pretty well necessary for a kit such as this, is a full rigging diagram and instructions. Naturally they use thread for this, so you may wish to substitute your favorite rigging materials as the plane will look decidedly bare without it. The actual construction of the kit should provide little in the way of problems as these Life-like kits generally go together well. However, I cannot recommend it for beginners as it should be rigged to be properly finished and this is not a simple rigging job.